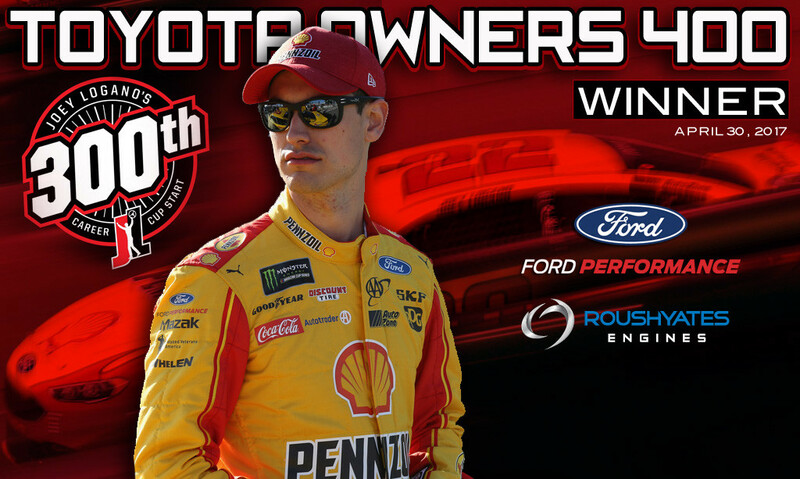 1-2 FORD FINISH / LOGANO TAKES RICHMOND! 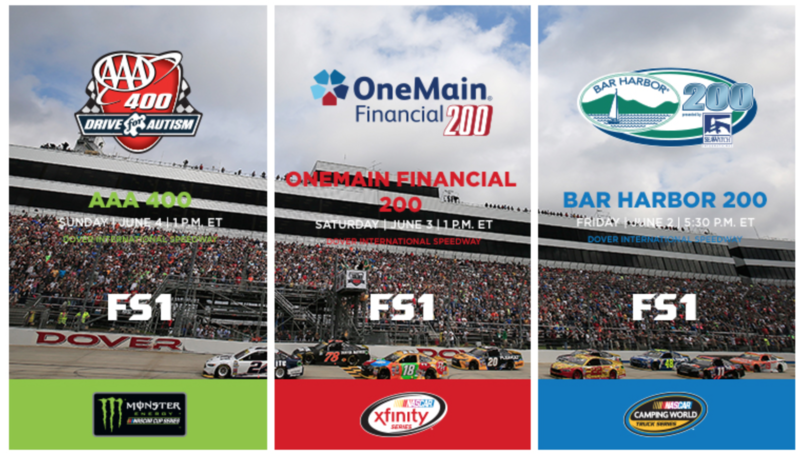 RICHMOND, Vir., May 1, 2017 – In Joey Logano’s 300th start, he captured his first 2017 Monster Energy NASCAR Cup Series win at Richmond International Raceway. 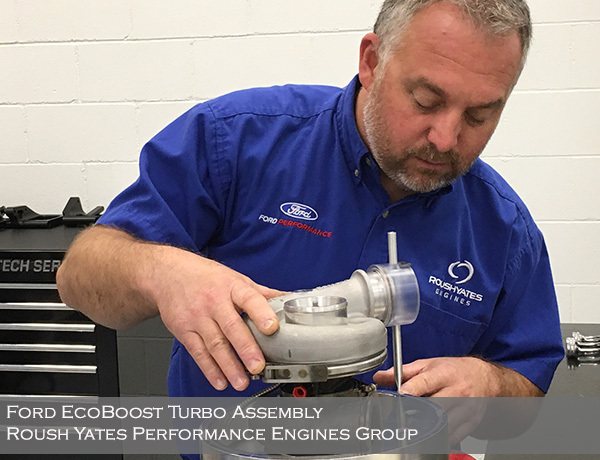 As the exclusive Ford Performance engine builder for NASCAR, Roush Yates Engines in partnership with Ford Performance powered the No. 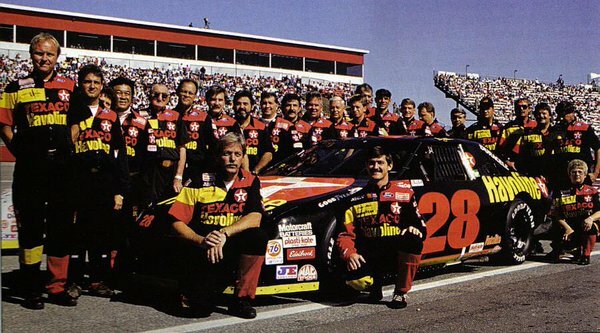 22 to victory lane in the Toyota Owner’s 400. 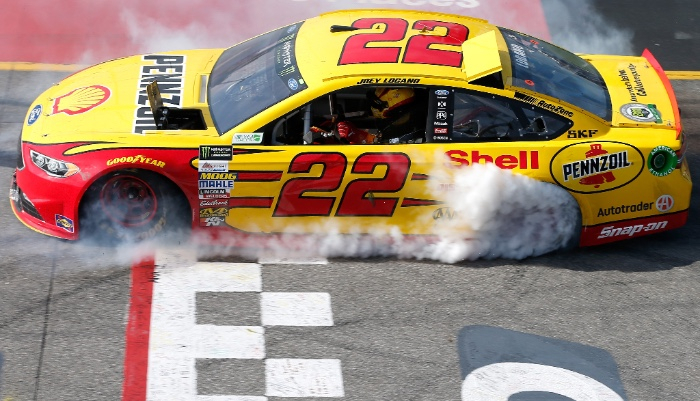 Logano led Team Penske to their third team win of the season and showing the Ford power, teammate Keselowski made it a 1–2 finish (fourth all time for Team Penske), 0.775 seconds behind Logano. 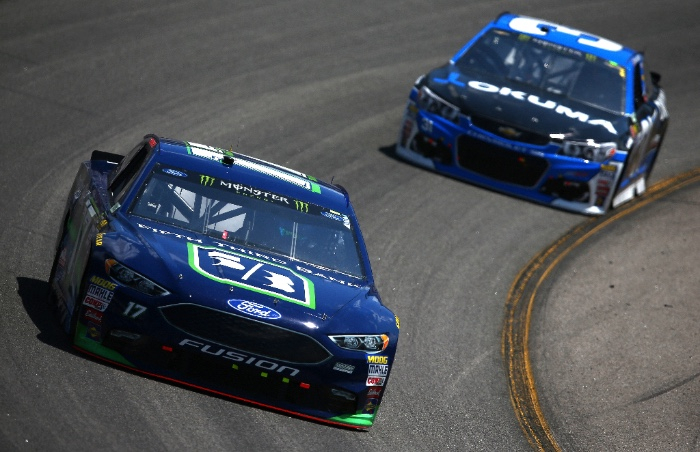 Both Penske drivers and Ford teammate Kurt Busch, from Stewart-Haas Racing have now secured a position in the playoffs. “I’m proud of the effort of the team. 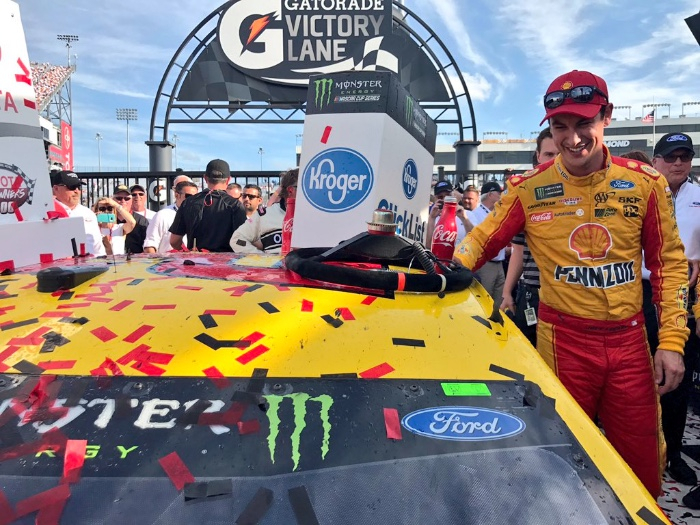 We executed under pressure today and brought a car home that was a fifth-to-10th-place car to Victory Lane,” commented Logano in victory circle. A Total of six Ford Fusions finished in the Top-10; No. 17 Ricky Stenhouse Jr. from Roush Fenway Racing in P4, teammates No. 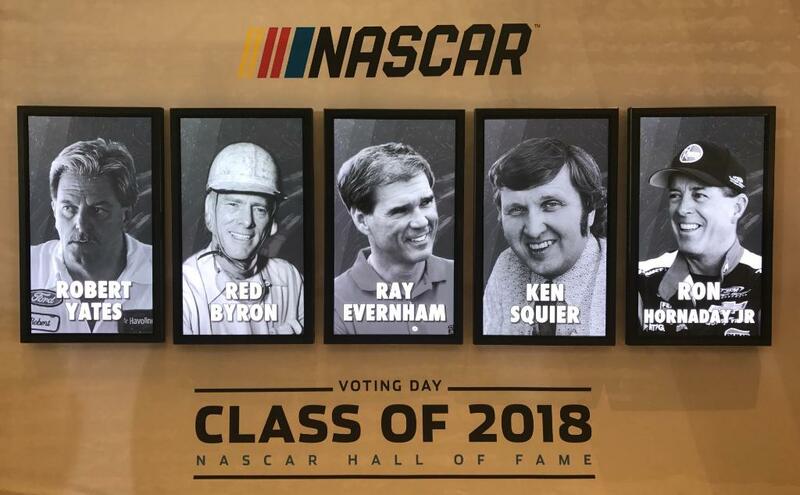 4 Kevin Harvick and No. 41 Kurt Busch finished P5 and P8 respectfully and Aric Almirola from Richard Petty Racing finished P9. The Ford Fusions battled for the lead all day, leading a total 146 out of the 400 lap race; 25 laps by Logano, 110 laps by Keselowski and Harvick with 11 laps. 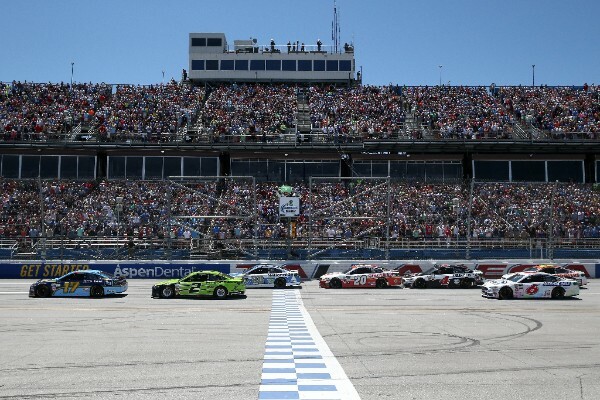 Ford has won four out of the first nine Monster Energy NASCAR Cup Series races in 2017.The Ford teams will ride this momentum into one of race fans favorite tracks – Talladega Superspeedway. Tune-in for the next high speed battle on Sunday, May 7th | 2:00 PM ET | FOX. Reference the full 2017 schedule on www.roushyates.com. 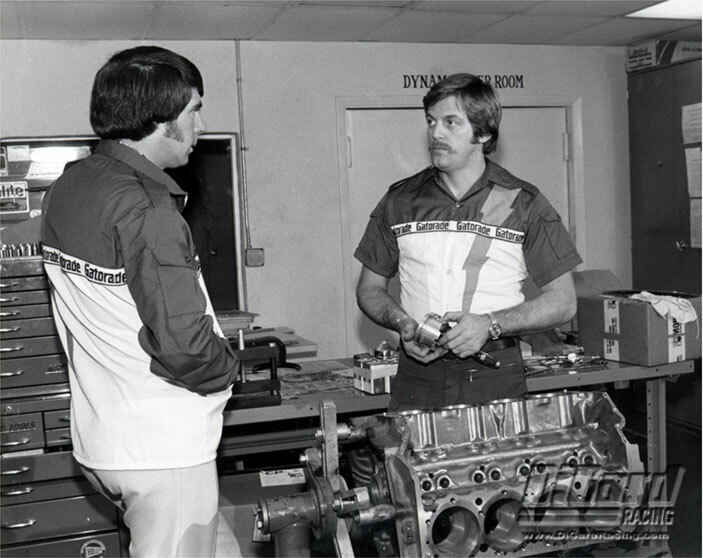 13 CHAMPIONSHIPS – 293 WINS – 262 POLES! 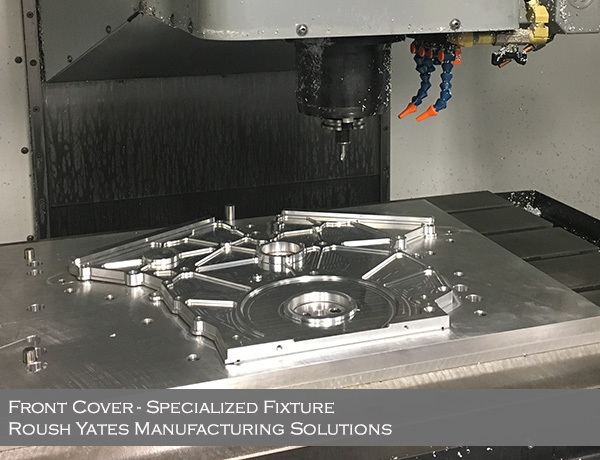 MOORESVILLE, NC, May 2, 2017 – Roush Yates Engines is pleased to announce a multi-year extension with Mitee-Bite Products, a premier supplier of high-density low profile clamping solutions, which prides itself on finding solutions to work holding applications. 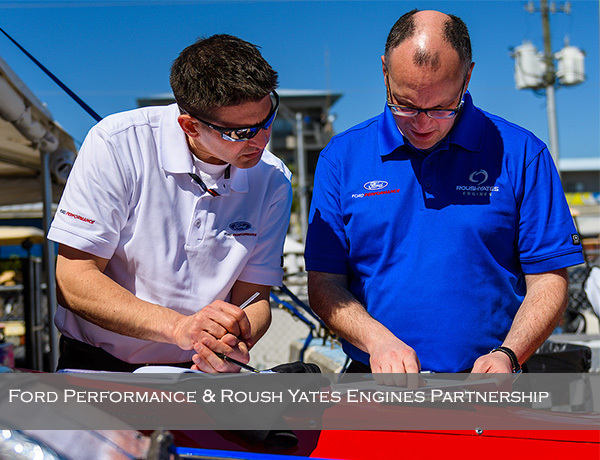 The official partnership started in 2015, but the relationship and trust of their quality products has been in place since the founding of Roush Yates Engines in 2003. 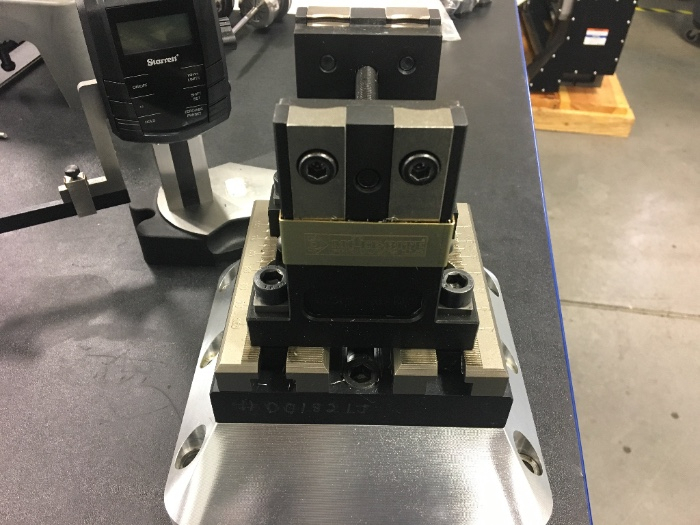 “The entire family at Mitee-Bite has been a great partner to us in providing world-class clamping tools, fixtures and solutions to solve our clamping challenges. They understand how critical it is to have machined parts made within precise tolerances. 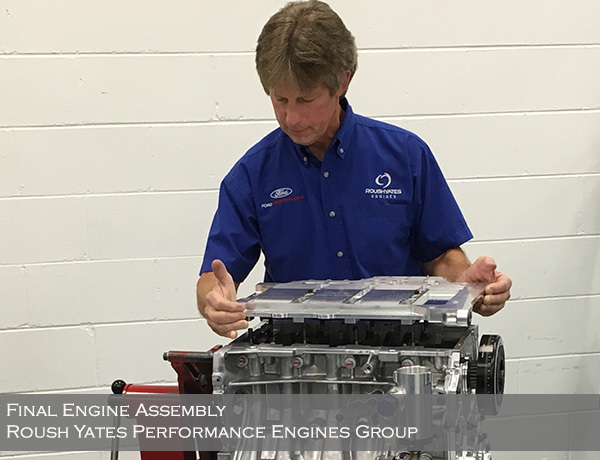 Their ability to produce and fixture quick prototypes as well as higher production runs is essential to our success,” said Todd English, Roush Yates Engines, Vice President Business Development. “Mitee-Bite makes a generous amount of clamping solutions for all types of shops. 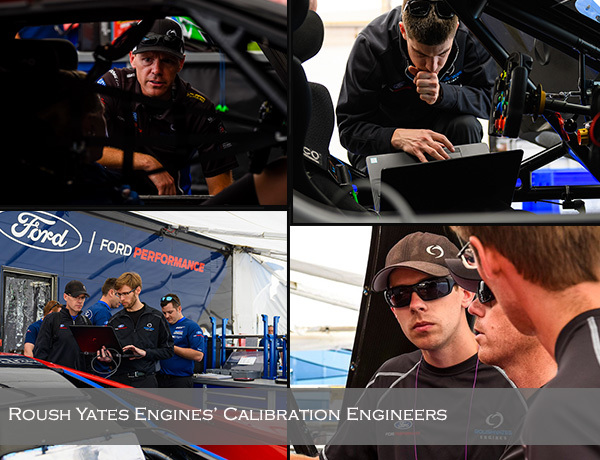 Their experienced team will help design and manufacture any regular, irregular or challenging part in the work holding arena,” commented Tom Bashford, Roush Yates Engines, R&D Rapid Prototype Manager & Machinist. “Mitee-Bite’s Loc-Down® System works great for holding fixtures to sub plates. 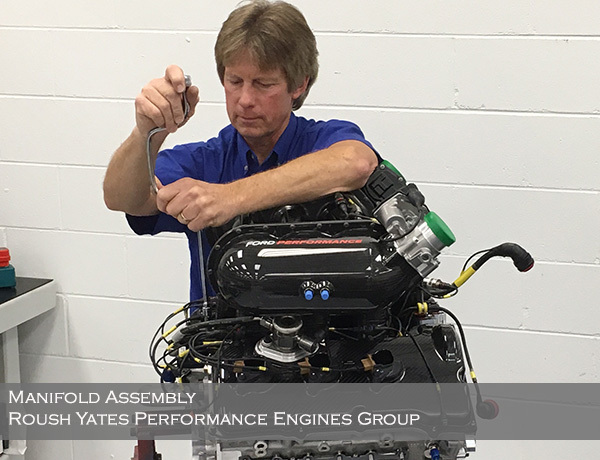 The Pitbull® clamps are great for many applications and I rely on Id Xpansion™ clamps for securely holding parts with bores on them,” noted Ricky Strader, Roush Yates Engines, Manufacturing Engineer. 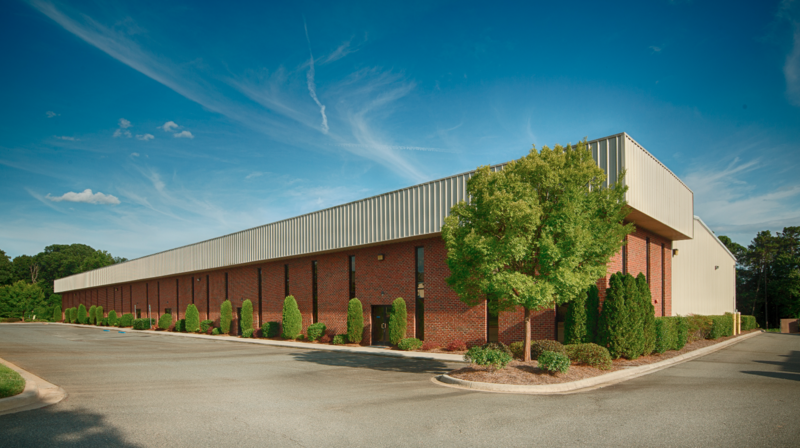 Roush Yates Manufacturing Solutions, a division of Roush Yates Engines in Mooresville, NC relies heavily on Mitee-Bites’ quality clamping devices. 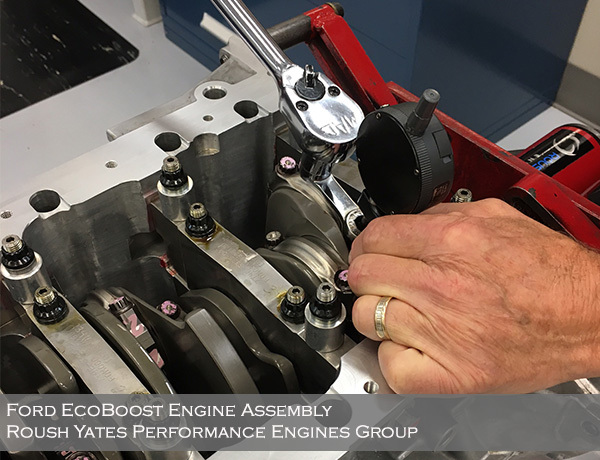 Over 50 CNC machines utilize Mitee-Bite products to assist in machining hundreds of engine components for the Ford FR9 EFI V8 NASCAR engine, the twin-turbo Ford EcoBoost V6 race engine and the Roush Yates RY45 engine. 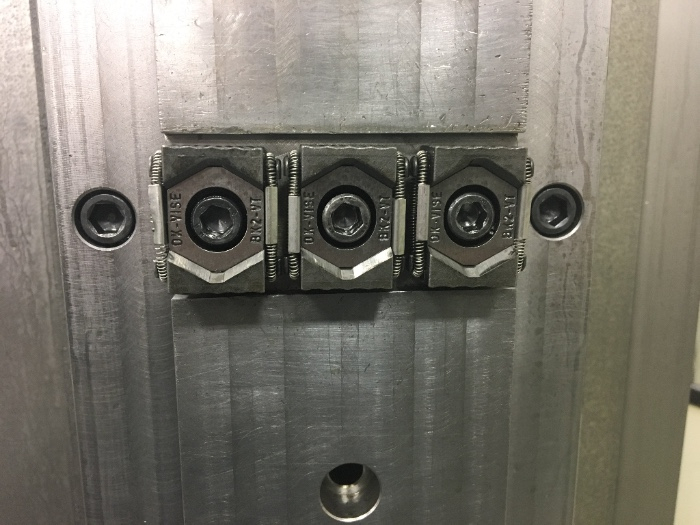 Mitee-Bite Products LLC, located in Center Ossipee, NH is the innovator of compact, low-profile edge clamps geared towards improving productivity and providing solutions for difficult work holding applications. Continually developing new products to provide customers with a wide assortment of high-density low profile clamping solutions and assistance with clamping recommendations. Mitee-Bite Products takes great pride in producing products that allow customers to improve their processes by simple means. 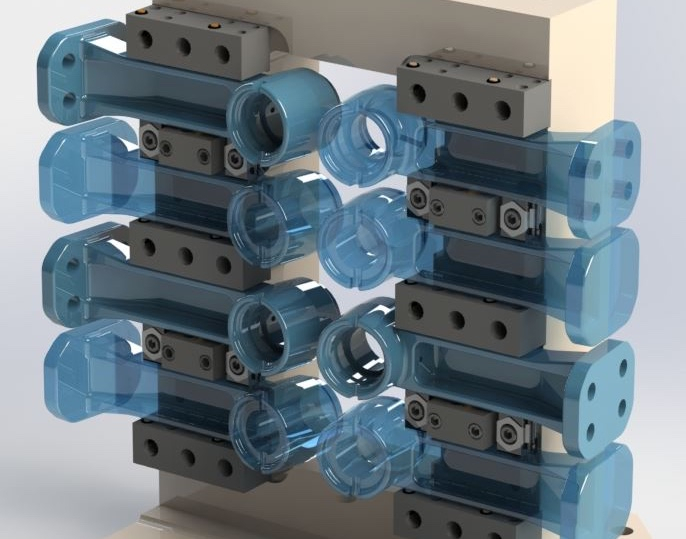 Through constant design and development, Mitee-Bite Products keep the spindle running, reducing idle spindle time, overall material cost and set-up time. 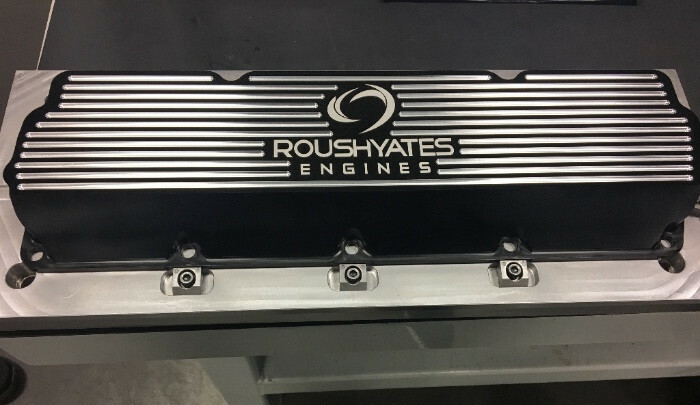 Roush Yates Engines is a leading edge engine development company, with three state-of-the-art facilities based in Mooresville, NC; which include Roush Yates Engines, Roush Yates Performance Engines Group, focused on road racing and Roush Yates Manufacturing Solutions, a world class manufacturing center and ISO 9001 / AS9100 certified. 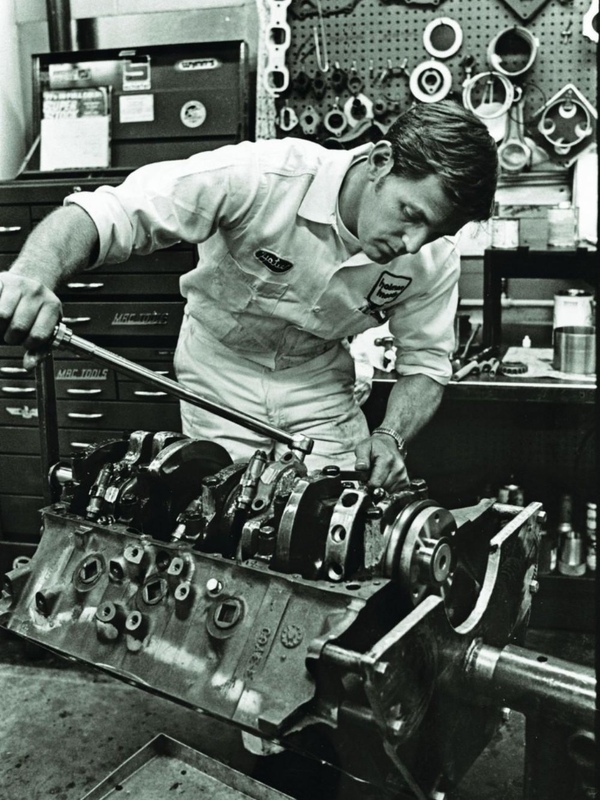 The company’s core business includes designing, building and testing purpose built race engines. 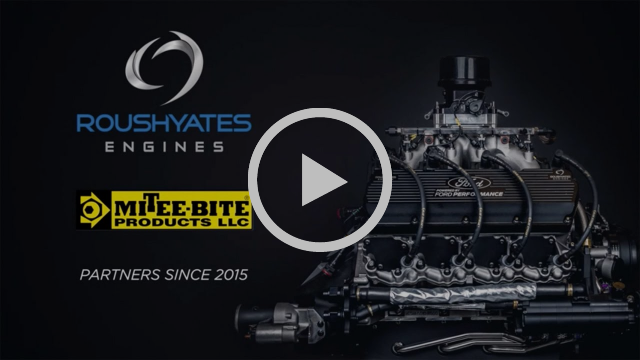 Roush Yates Engines in partnership with Ford Performance is the exclusive engine builder of the NASCAR FR9 Ford V8 engine and twin-turbo EcoBoost Ford V6 race engine that powers the Ford GT supercar. TALLADEGA, Ala. May 8, 2017 – Polesitter, Ricky Stenhouse Jr., driver of the No. 17 Roush Fenway Racing Ford Fusion won his first career Monster Energy NASCAR Cup Series race at Talladega Superspeedway. 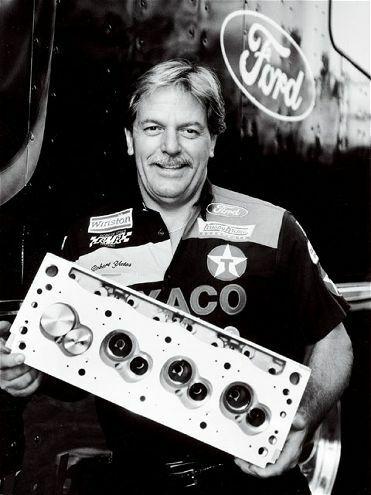 In partnership with Ford Performance, Roush Yates Engines provided the Ford FR9 EFI horsepower that propelled the No. 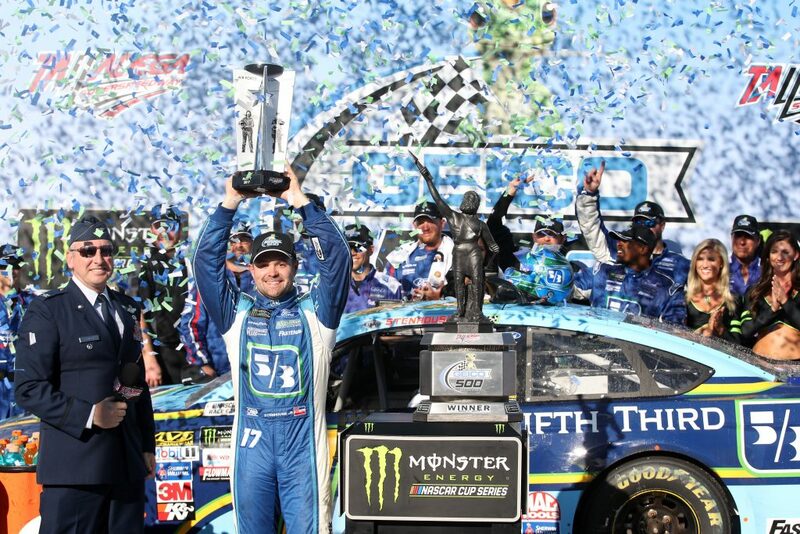 17 to victory lane in the GEICO 500. 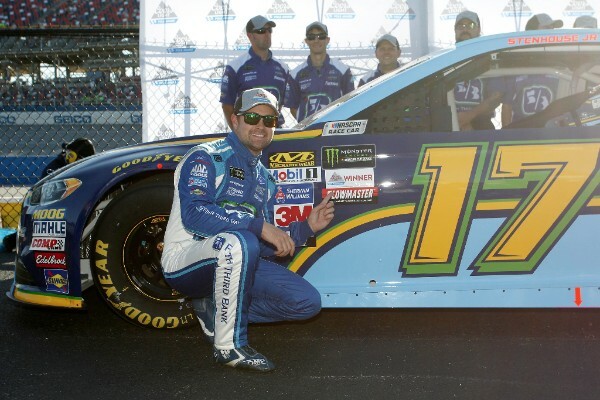 The weekend started off fast with qualifying, showcasing the ‘Ford Power’ with Stenhouse Jr. winning the first pole of the season for Roush Fenway Racing, recording a lap speed of 191.547 and fifth season pole for Ford Performance. A total of three Ford Fusions qualified in the Top-5; No. 2 Brad Keselowski in P3 and No. 6 Trevor Bayne in P5. 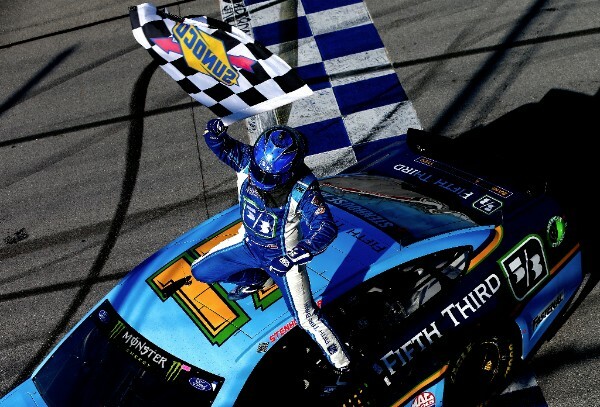 Stenhouse Jr. led the pack of 40 cars across the start/finish line to start the race for the first time this season and leveraged the horsepower of the Ford FR9 EFI engine to lead the first laps of the race. 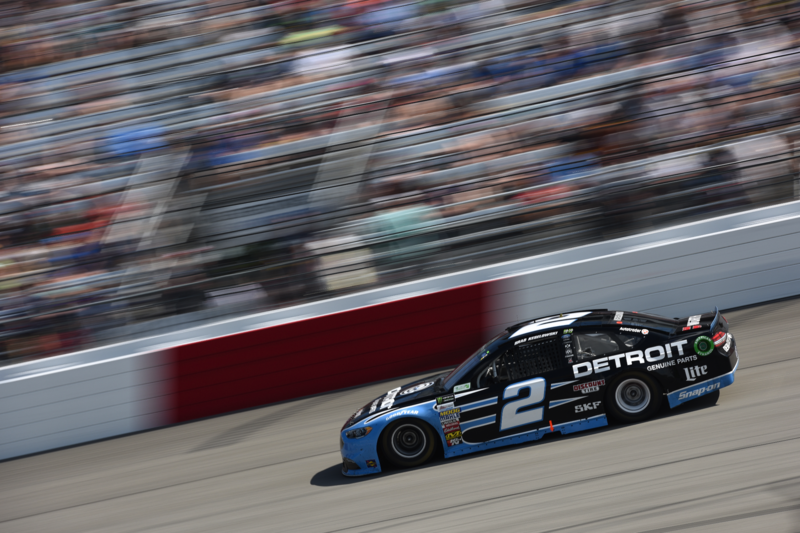 The Ford Fusions ran up front for the majority of the day, as Keselowski took the first stage win, with six different Fords leading throughout the race. The No. 17 survived the notorious Talladega ‘Big One’ making it through a 18 car wreck. 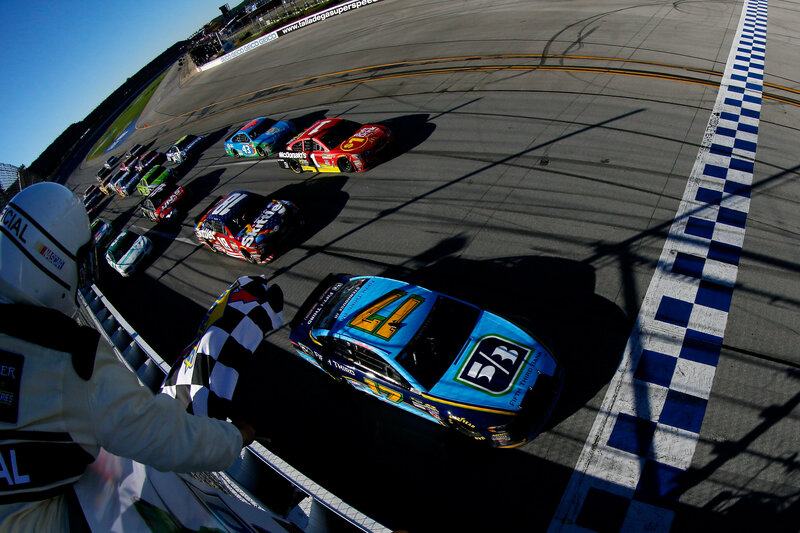 Stenhouse Jr. went onto to position himself perfectly, in second position, running bumper to bumper with Jimmy Johnson, as the final caution came out. It all came down to a high pressure overtime shootout drag race. Starting on the inside of Kyle Busch, Stenhouse Jr. got a great restart with a push from Johnson and on a last lap pass took the lead and checkered flag, winning by .095 seconds over Jamie McMurray. 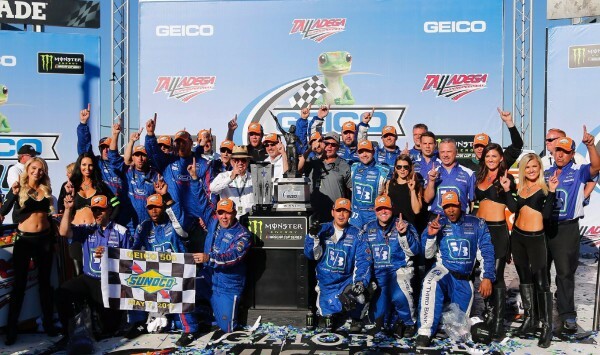 The win in Talladega marked Roush Fenway Racing’s 136th win and fifth win at the Superspeedway. 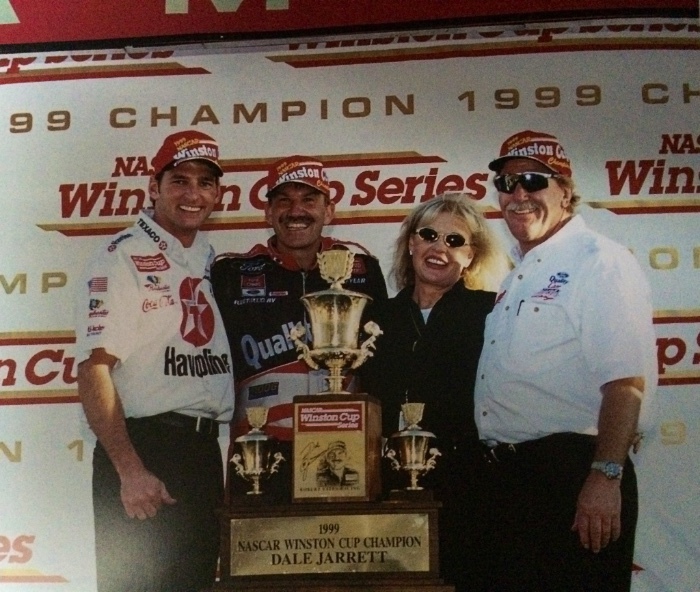 This weekend also marked Roush Yates Engines 295th overall win since 2004. 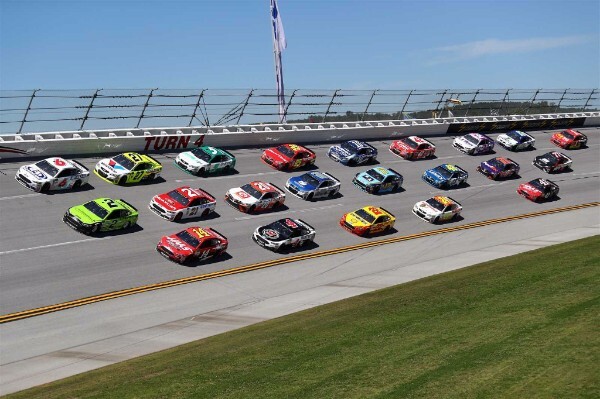 No manufacturer has dominated the restrictor-plate tracks of Daytona and Talladega in recent years more than Ford, which has won 14 of the last 26 Monster Energy NASCAR Cup Series events at these two facilities. 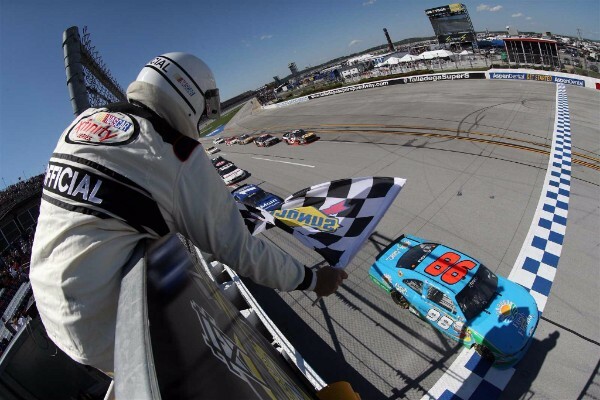 In fact, Ford has won at least two of the four races in each of the past three seasons and with Stenhouse’s win it makes it four in a row for Ford Performance at Talladega (Logano 2015 Fall, Keselowski 2016 Spring and Logano 2016 Fall). 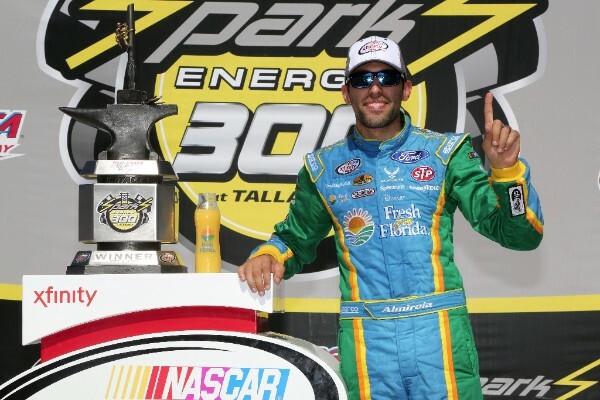 In the NASCAR Xfinity Series, Sparks Energy 300 Aric Almirola, driver of the No. 98 Fresh From Florida Ford Mustang stayed focused as he worked his way up to the front from 23rd position, to win the first stage of the race. 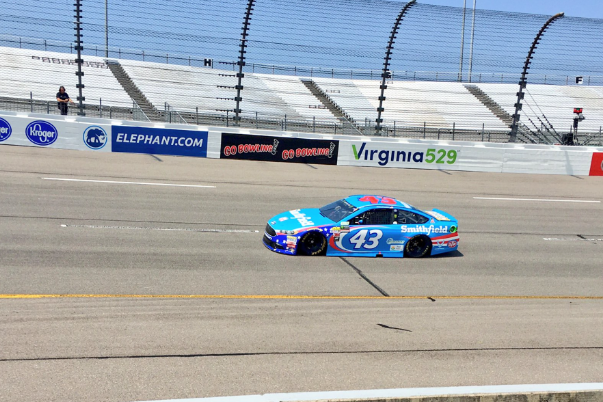 Almirola would get shuffled back during the middle of the race, but would follow the No. 22 Joey Logano of Team Penske back to the front and take the lead with nine laps to go. Logano would keep the pressure on, but Almirola would prevail to win his first race of the season for himself and Biagi DenBeste Racing. Ford Performance teammate Logano would finish second. The Ford Fusions have won five out of the first 10 races of the MENCS season. They will make their way to Kansas Speedway next. Tune-in to see what unfolds on Saturday, May 13th | 7:30 PM ET | FS1. 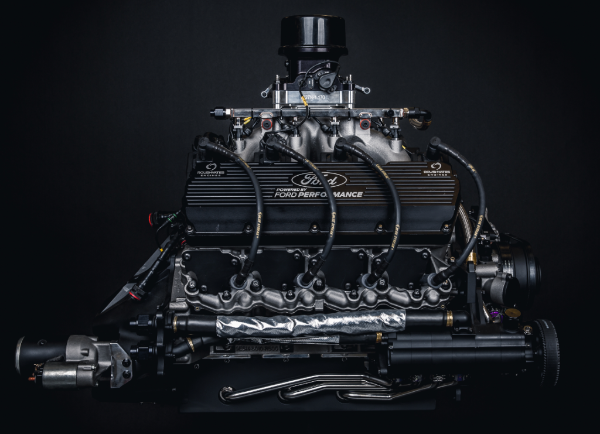 Reference the full 2017 schedule on www.roushyates.com. 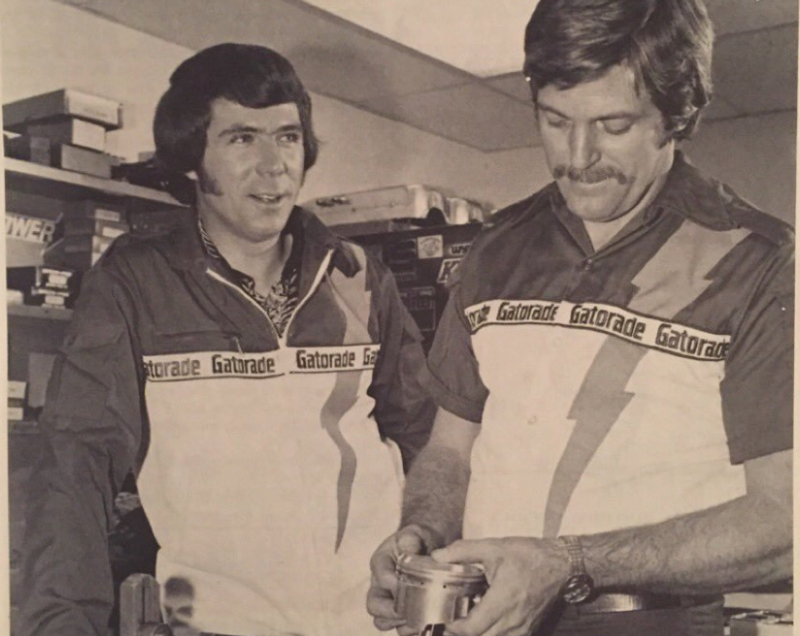 13 CHAMPIONSHIPS – 295 WINS – 263 POLES! 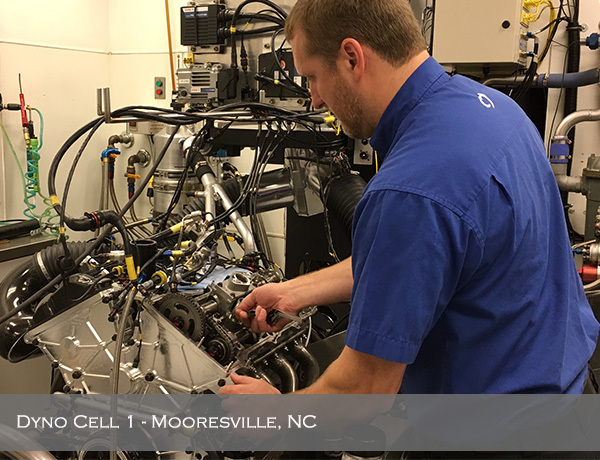 MOORESVILLE, NC, May 9, 2017 – Roush Yates Engines and RKL eSolutions are pleased to announce a new multi-year technology partnership. RKL eSolutions provides business software and IT/Networking Solutions from coast to coast with several offices throughout the United States. 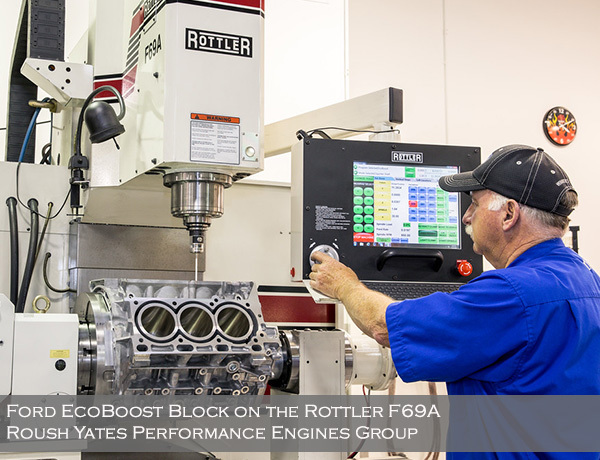 RKL eSolutions implemented the fast, simple and flexible Sage X3 ERP system at Roush Yates Engines. Their team is dedicated to building solutions that streamline the IT process and enhances our company’s productivity. 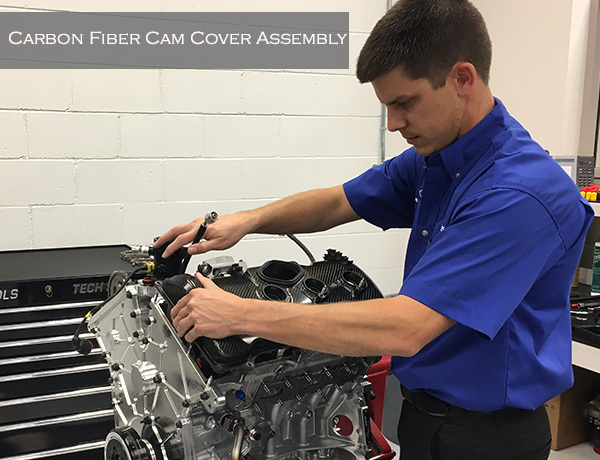 As we engineer, design, and build over 1,000 high performance race engines, fast and accurate data is imperative to manage our daily workload from engine production to CNC manufacturing. From sales to accounting, in the warehouse or on the shop floor, and from the server room to the cloud, RKL eSolutions offers the resources and expertise to support all of your technology needs – software, IT, and custom development all under one roof. For more information about RKL eSolutions visit https://www.rklesolutions.com or contact them at (717) 735-9109. June 19th, 2016 | History was made! 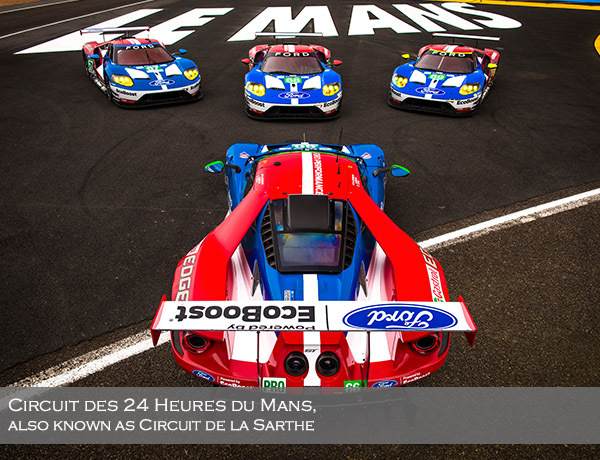 In its debut season, the Ford GT achieved the ultimate success and made road racing history by delivering on its mission of winning the 24 Hours of Le Mans, fifty years after the first GT won Le Mans in 1966. 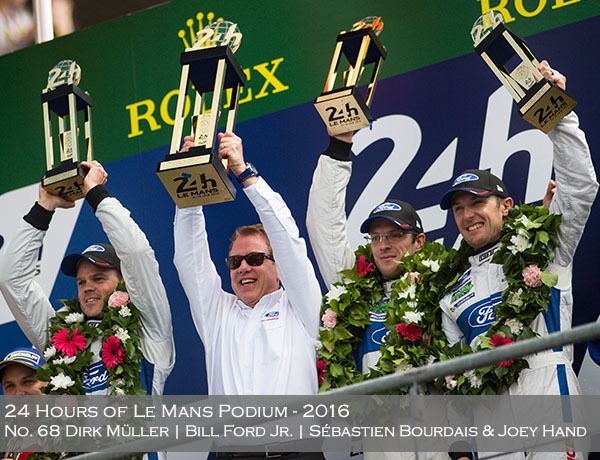 Not only did the Ford GT win, but it also achieved a third place podium finish, almost sweeping the podium in the Le Mans Grand Touring Endurance (LMGTE) class. The Ford GT ‘supercar’ immediately rose to the pinnacle of road racing history. Preparation for the 2017 return to Le Mans hit its stride in late-2016. Knowing that the 2017 race engines would need to be ready for shipment in less than seven months, the pressure was on. 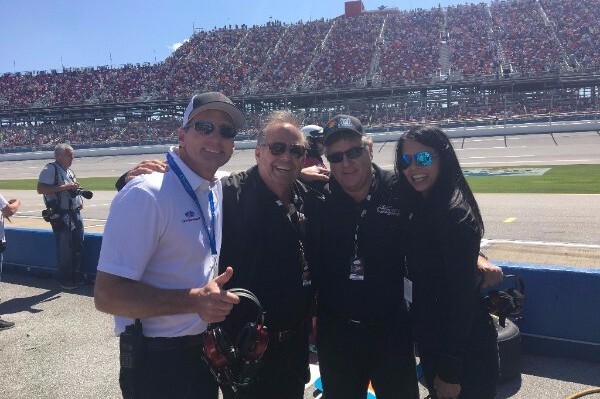 The Team, led by Ford Performance, Roush Yates Engines, Ford Chip Ganassi Racing and Multimatic Motorsports had to make quick work of evaluating needs and logistics during this time period. These seven months were critical to the 2017 preparation. There was a constant flow of information between the four partners to ensure that everyone had the latest information to act on. It was crucial that the team members stayed on the same page, which was sometimes challenging with partners and suppliers from around the world collaborating on the project. 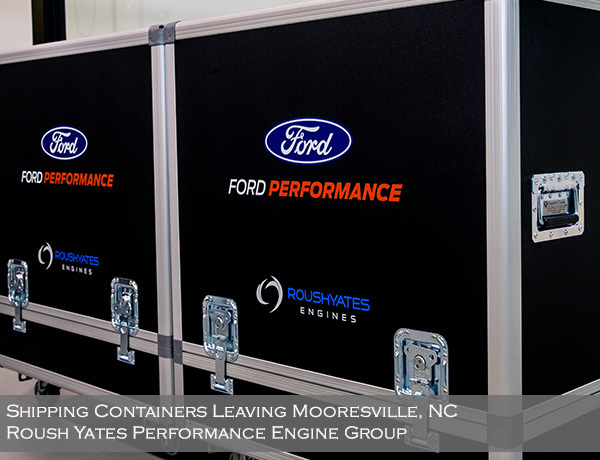 “As a leading edge engine development company, with 3 state-of-the-art facilities based in Mooresville, NC; Roush Yates Engines (NASCAR division), Roush Yates Performance Engines Group (road racing division) and Roush Yates Manufacturing Solutions (CNC machining division) enables us to streamline the flow of design, development and production of various critical components, all in house,” according to Dan Keenan, Design & Analysis Manager for Roush Yates Engines. At the beginning of the build process each engine is assigned a unique engine number, which is assigned to a specific build cart prior to assembly. 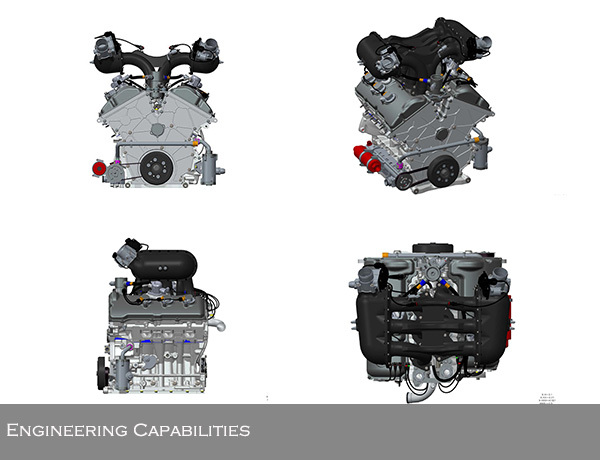 Each build cart contains all the individual parts and sub-assemblies necessary to build an engine. 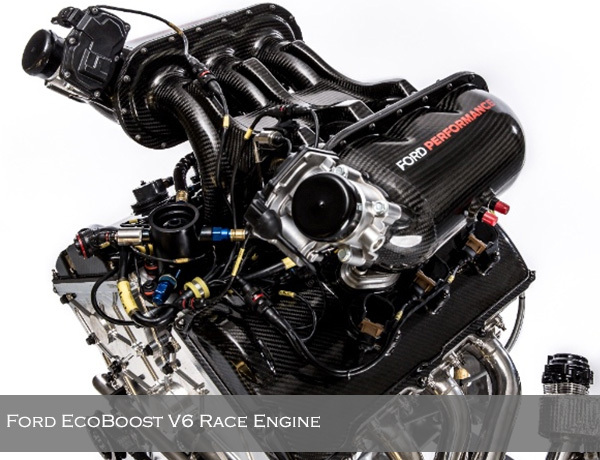 The Bill of Materials contains over 1,600 components to produce one twin-turbo Ford EcoBoost V6 race engine. 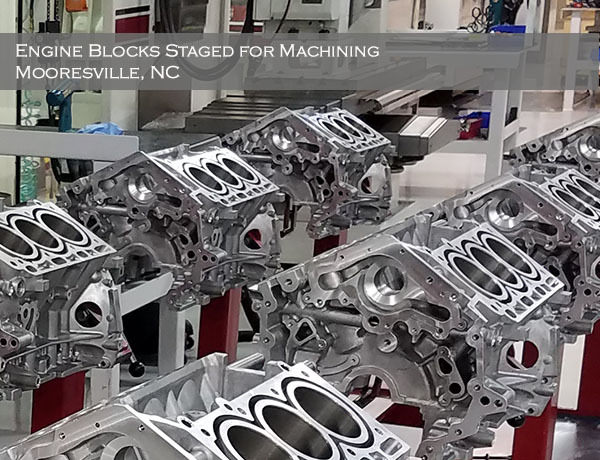 Several of these parts are provided directly from Ford manufacturing facilities; blocks originate from Ford’s Lima Engine Plant (Lima, OH), where a majority of the machining is completed. The GT heads are manufactured in Ford’s Cleveland Engine Plant (Cleveland, OH). 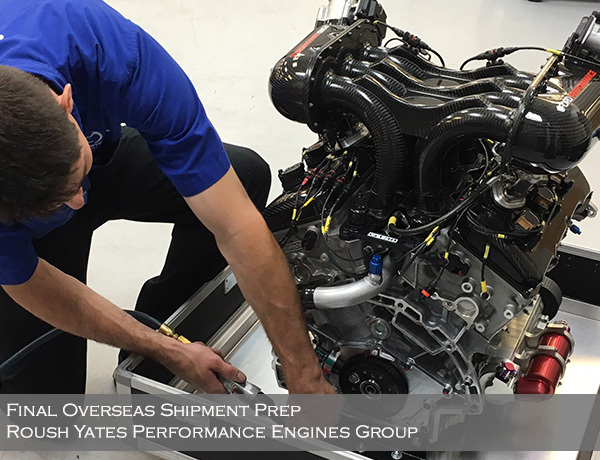 These components are delivered to the Roush Yates Engines location for final machining, assembly and race prep. 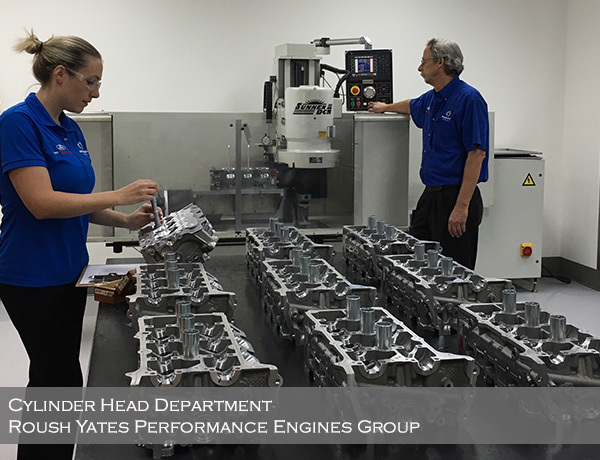 The cylinder heads are lightly modified with CNC machining on the combustion chambers and ports. High-temperature seats and exhaust guides are also installed. These are very precise and delicate operations that are performed by the Cylinder Head Department. 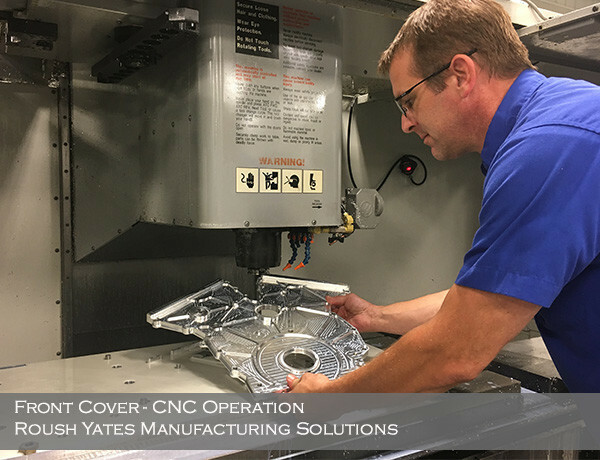 In combination with the Ford OEM parts, specialized fixtures and components; such as the EcoBoost front cover are created, machined and processed in the Roush Yates Manufacturing Solutions state-of-the-art CNC machining facility in Mooresville, NC. A variety of custom cutting and clamping tools are utilized at this facility to ensure premium quality parts. The components are then meticulously assembled and quality checked to verify that they meet all drawing tolerance requirements. 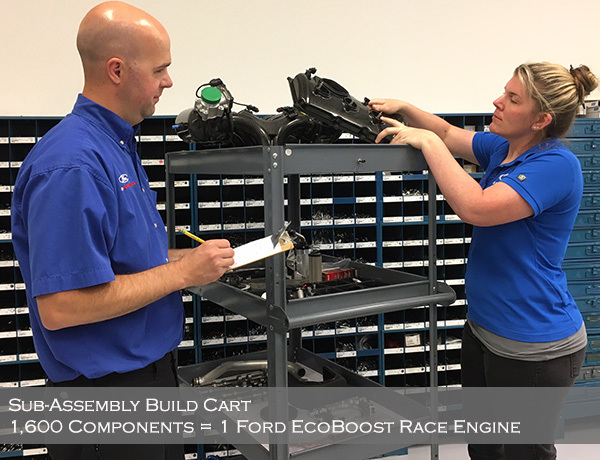 Because of the packaging restrictions within the engine compartment of the Ford GT race car and the complexity of the adjoining components, it is critical that the engine meets the tightest of tolerances. 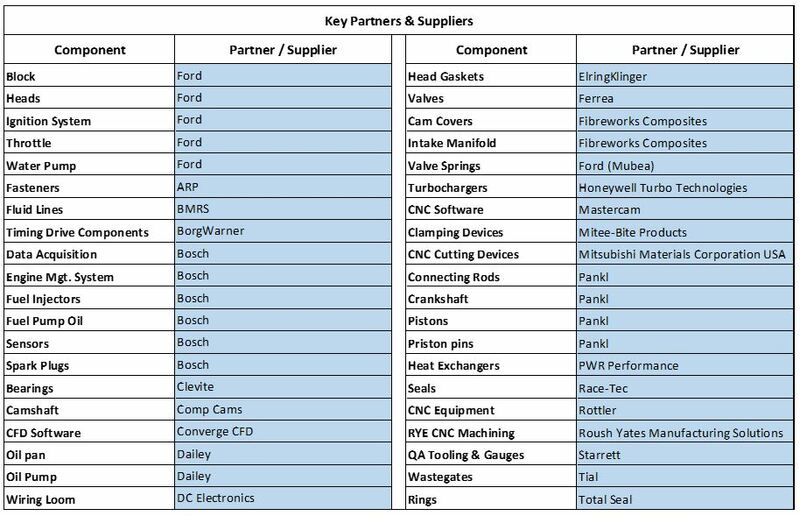 As part of quality control, all critical functional components used in the build of an engine have 100% traceability throughout the manufacturing and build process. 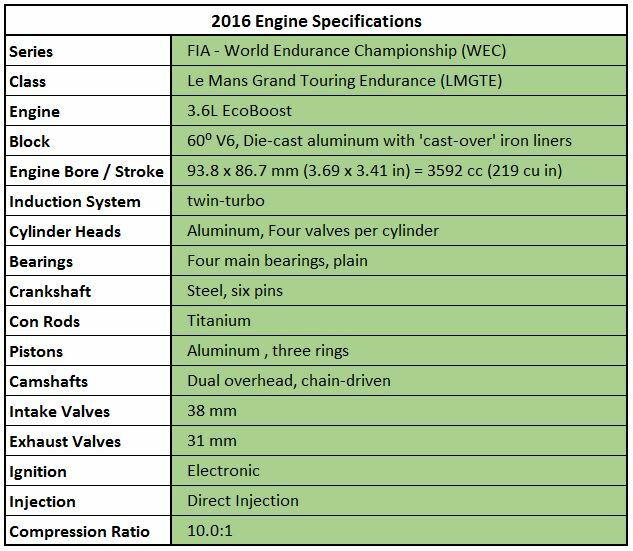 In addition, the FIA rule book requires a significant number of the engine components to be homologated. The homologation process includes submitting material specifications, weights and dimensions of these components, along with photo documentation to the FIA. 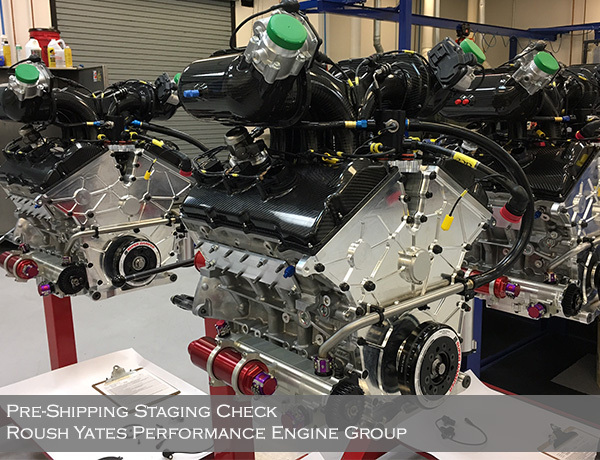 Durability and reliability are vital in a 24-hour endurance race, that is why every engine that is completed at Roush Yates Engines goes to the Dyno facility for final inspection and validation. 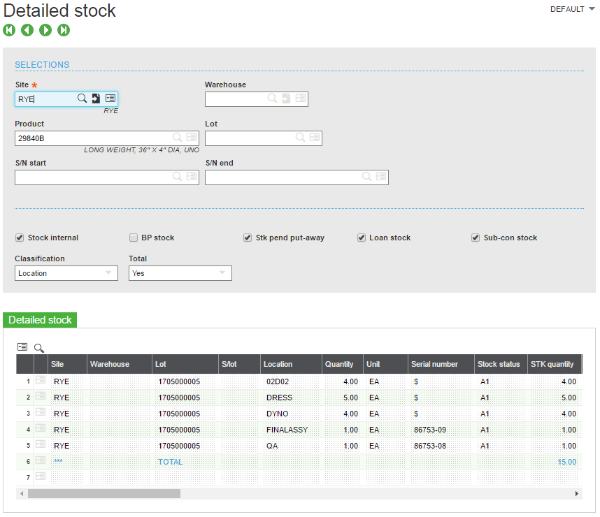 Each engine is run through a protocol of tests before it is approved and signed off for shipping. 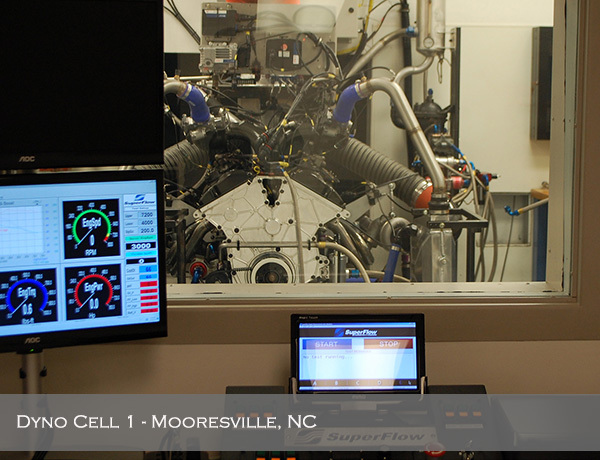 A key piece of this high-tech power plant is the Roush Yates Engines’ Calibration Engineers. 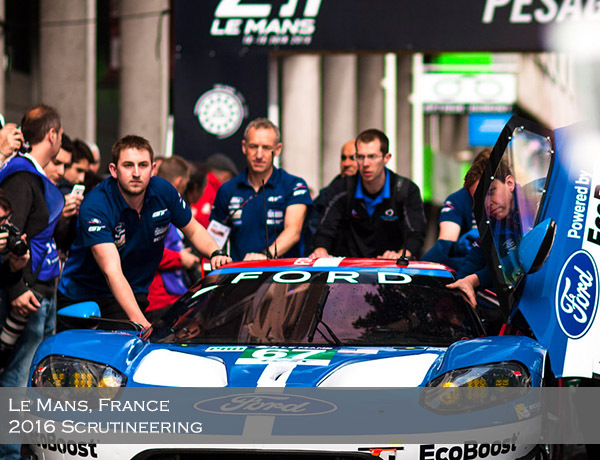 They work dynamically with the Ford Chip Ganassi Racing UK and US teams to review millions of lines of telemetry from track and test events in order to refine and adjust engine mapping and traction control calibrations in parallel with driver feedback. All this is done in order to dial in the ultimate performance package for each individual car and driver(s). Endurance road racing is unique in the fact that for the 24 Hours of Le Mans race, each car will have three different drivers during the course of a race, each running various stints (race segments) of the race. 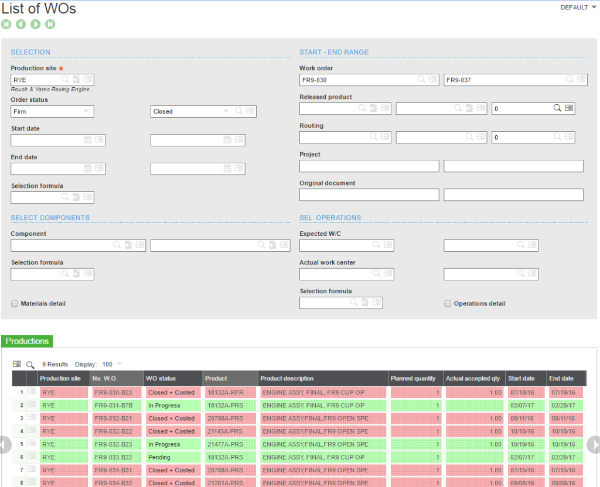 This adds an additional layer of complexity to the calibration formula. Final checks completed. Engines packed and ready to ship to Le Mans, France. This is the equivalent to 5,400lbs. 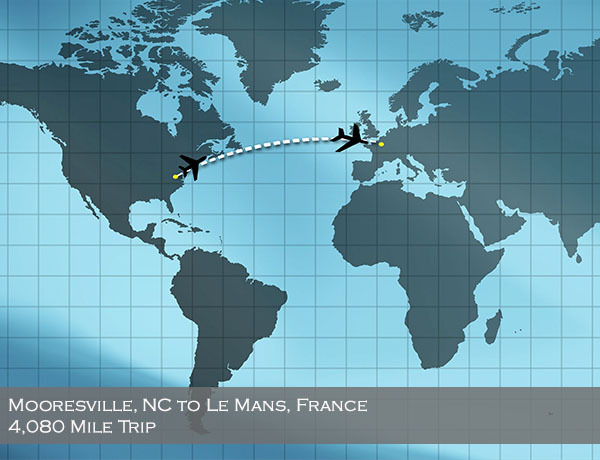 of freight, that will travel over 4,080 miles to get to their final destination, Le Mans, France. The engines are packed into individual custom containers and staged for the overseas trip. The “Final Countdown’ has begun. 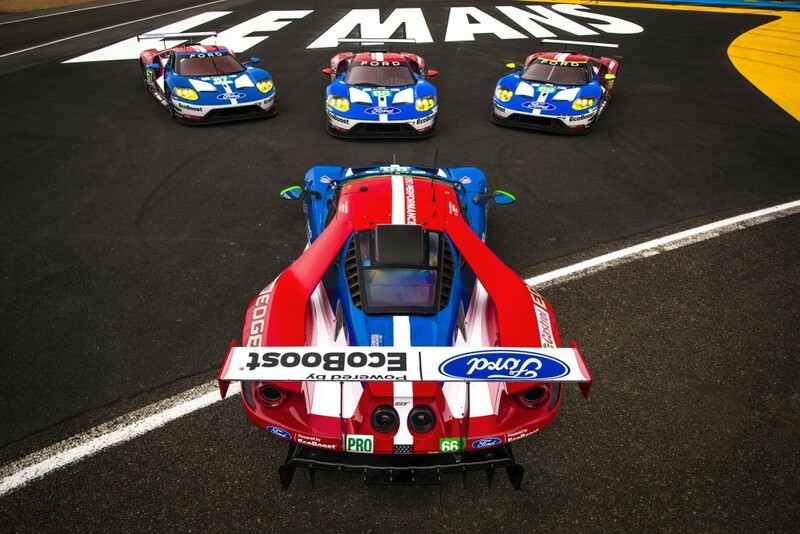 The next time the engines will be seen they will be powering the Ford GT race cars in the 24 Hours of Le Mans. 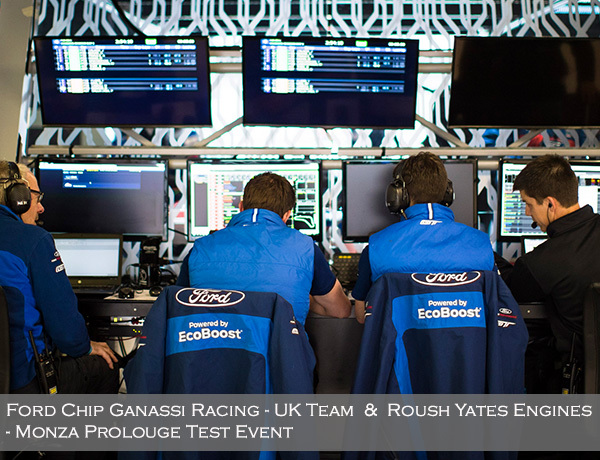 The engines will arrive, along with the Roush Yates Engines Calibration Engineers, Ford Chip Ganassi Racing and Multimatic Motorsports team for the Le Mans Scrutineering and Test event. 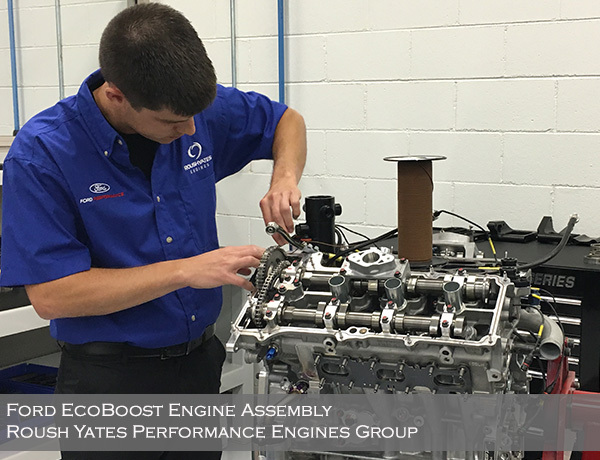 Roush Yates Engines is a leading edge engine development company, with three state-of-the-art facilities based in Mooresville, NC; which include Roush Yates Engines, Roush Yates Performance Engines Group focused on road racing and Roush Yates Manufacturing Solutions, a world class manufacturing center and ISO 9001 / AS9100 certified. 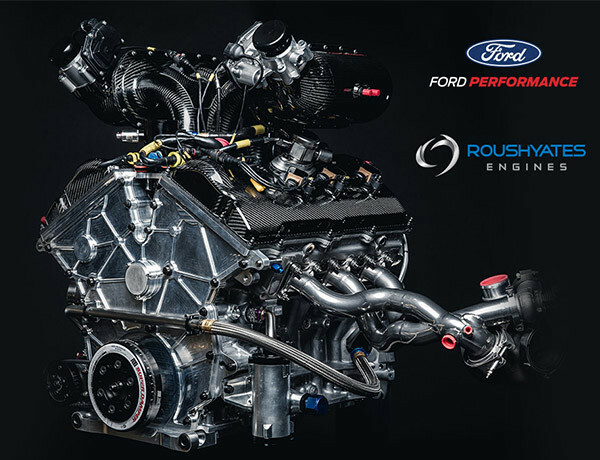 The company’s core business includes designing, building and testing purpose built race engines.Ford Performance in partnership with Roush Yates Engines is the exclusive engine builder of the twin-turbo Ford EcoBoost V6 and Ford Mustang 5.2L V8 road race engines along with the NASCAR Ford FR9 V8 race engine.With the unparalleled culture of winning and steeped in rich racing history, Roush Yates Engines continues to follow the company’s vision to lead performance engine innovation and staying true to the company’s mission, provide winning engines through demonstrated power and performance. 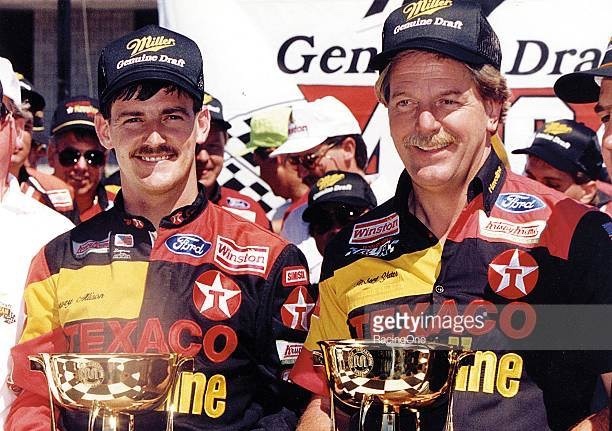 13 CHAMPIONSHIPS – 295 WINS – 265 POLES! BLANEY TAKES HOME 1st CHARLOTTE WIN! 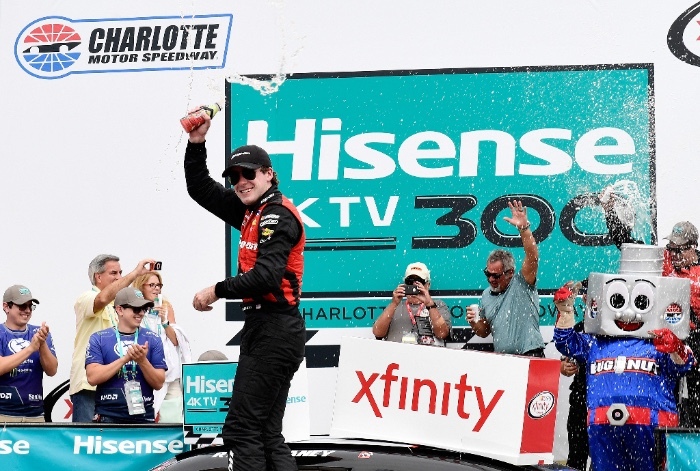 CHARLOTTE, NC, May 30, 2017 – Ryan Blaney won his first 2017 NASCAR Xfinity Series race at Charlotte Motor Speedway and the second for the No. 12 Team Penske Ford Mustang this year. 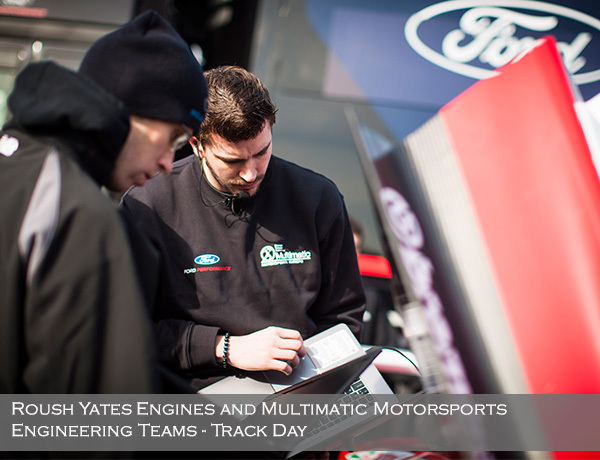 In partnership with Ford Performance, Roush Yates Engines provided the Ford FR9 horsepower that powered the No. 12 to victory lane in the Hisense 300. 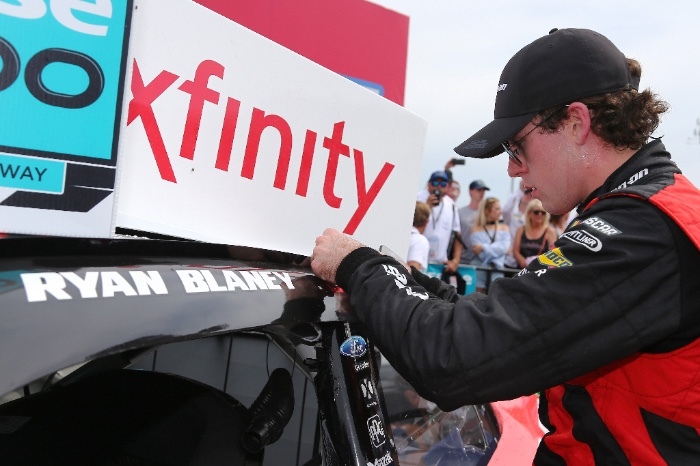 From the start of the race Blaney leveraged the horsepower of the Ford FR9 engine to move up through the field, from the rear to fourth place during the first segment of the race, where Ford teammate No. 4 Kevin Harvick from Stewart Haas Racing took the first stage win. The No.12 continued to battle hard to take the second stage win. The Ford Mustangs led a combined 168 laps in the Hisense 300 and it all came down to a battle among Ford teammates No. 4 Harvick, No. 22 Brad Keselowski and No. 12 Blaney. 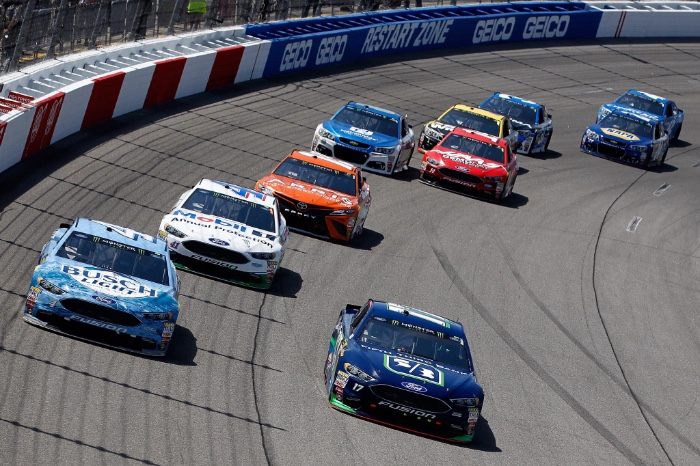 With three laps remaining in the 200 lap race, race leader, Harvick chose the outside lane, which put Keselowski behind him and the hard charging Blaney beside him on the inside. 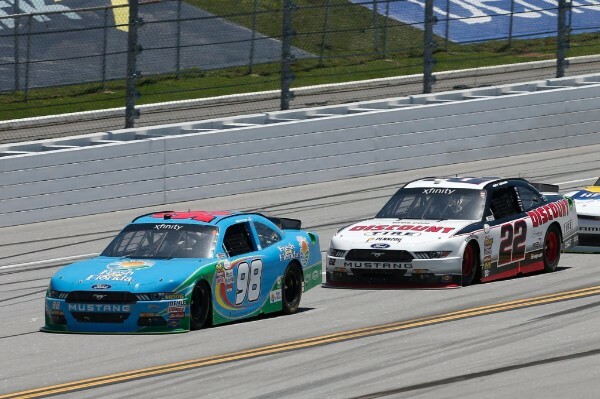 Blaney was able to stay close to Harvick at the restart and ultimately pass the No. 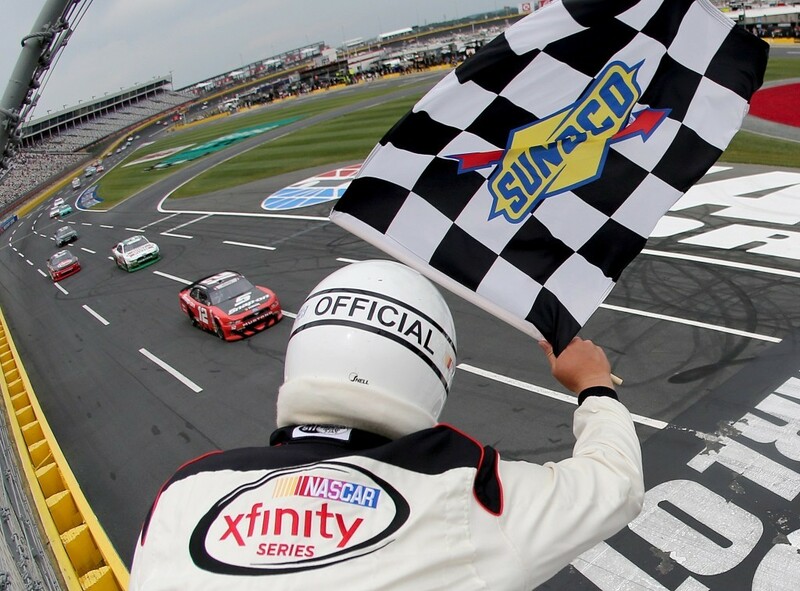 4 with two laps to go and took the checkered flag .244 seconds ahead of the Harvick, for his fifth career Xfinity win. 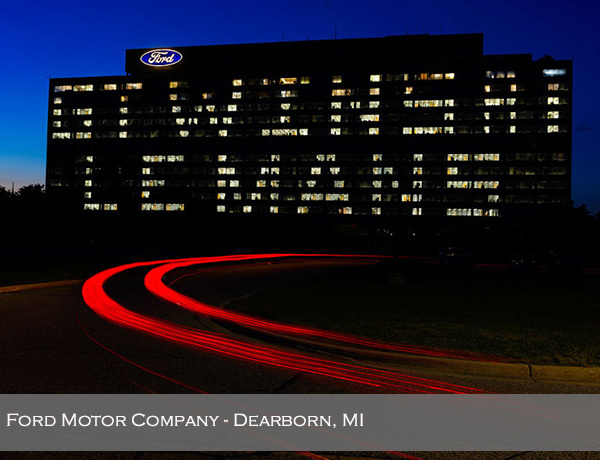 It was a strong finish for Ford Performance with four Ford Mustangs finishing in the Top-10. 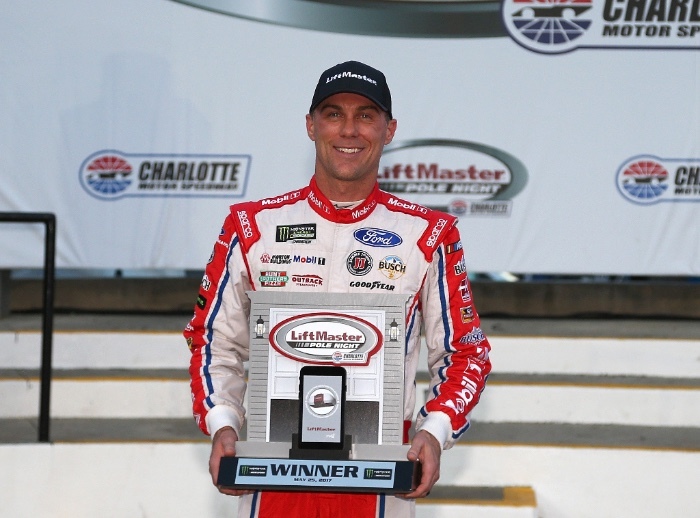 Charlotte Motor Speedway was also the sight of Kevin Harvick’s 20th career NASCAR Monster Energy Cup Series pole on Thursday night, making a total of seven cup poles for Ford Performance this season. 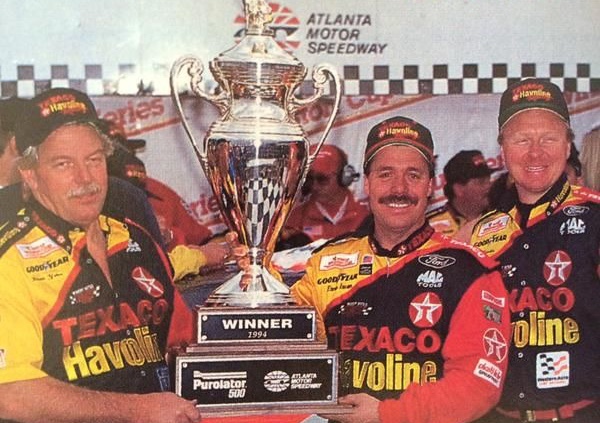 13 CHAMPIONSHIPS – 296 WINS – 265 POLES!